Design beautiful tealight holders to give as gifts or decorate your home with, using nature and natural materials. We will use pressed flowers and leaves, twigs, pinecones, feathers and raffia to create a collection of tealight holders. 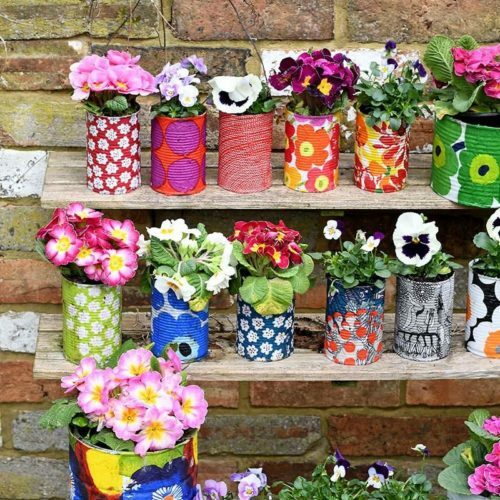 We will be upcycling tin cans using paint, spray paints, napkins, magazine cuttings, and other decorations to create beautiful plant pots and vases. This workshop takes place at Redcatch Community Garden and is suitable for children from 5 upwards and adults too. You will leave with one planter planted up with a plant from the community garden and one empty planter to plant yourself or use as a vase/pot. There is a maximum of 16 people per class. Workshop dates:TBC. Cost: £6 per person including all materials. Drinks and snacks available from the cafe. This workshop is all about egg painting using eco-friendly paper eggs that can be recycled. Using branches, pom poms, feathers, painted paper eggs and raffia, we will make fun Easter trees that look great on mantlepieces, in bedrooms or on dining tables. This workshop is for all the family to do together and suitable for children from 4 upwards and adults too. There is a maximum of 10 families on the day. Workshop location; Redcatch Community Garden. Workshop date: Tuesday 16th April. Time: 10am to 12.30pm Cost: £5 per person. We use bright card and acrylic paints to create beautiful pop art style leaf prints. You can choose your favourite 4 prints to mount on an A3 display board to put on your wall or give as a gift. A wreath is not just for Christmas. Using wreaths made at my wild wreath Christmas workshop or making a new moss based wreath, we will be updating foraged festive wreaths, with spring wildflowers and grasses. Workshop Location: Redcatch Community Garden. Workshop date: TBC. Time: Evening. Cost: £25 per person including all materials. Drinks and snacks available from the cafe. A lovely workshop for families to do together. We will use locally grown spring wildflowers to make simple flower crowns in celebration of May. Workshop location: Redcatch Community Garden. Workshop date: May, TBC. Time: 10am to 12.30pm Cost: £6 per person.